Actually, my wife did not know what to call this dish. But we were having friends over and so she prepared this for dinner. 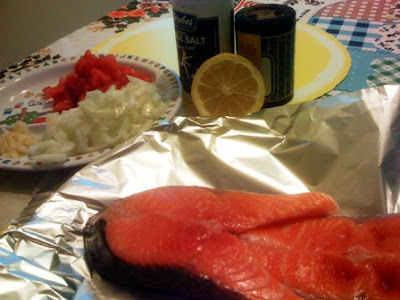 Our friend remarked, "how did you cook this steamed salmon?" Ummm... we steamed it? hahaha! So steamed salmon it is. This dish is so easy to make and yet the end result is simply wonderful! Great with piping hot rice. 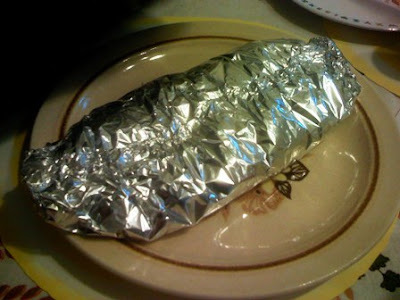 Place aluminum foil on plate, then place tuna on aluminum foil. The plate will help keep the other ingredients in place. 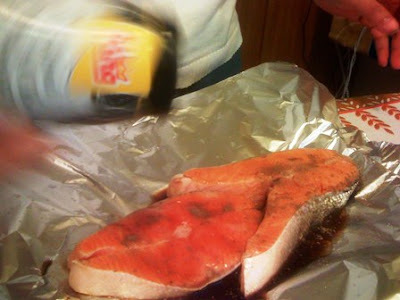 Pour soy sauce over the salmon. Squeeze lemon juice over the salmon. 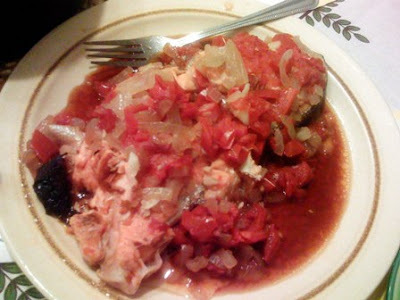 Spread onions, garlic, and tomatoes over the fish. 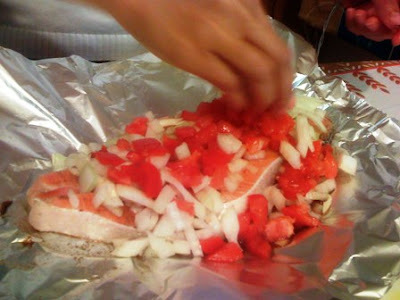 Next, encase the salmon and garnishings in the aluminum foil. Make sure it is closed tight so that no heat will escape. Lay salmon in a pan. A thick-bottomed pan with a cover will do nicely. Cover and place over medium heat. Cook for about half an hour. The fish will cook in its own juices, and the spices and flavourings will be absorbed into the salmon. The result is a soft, delectable dish! Our guests loved it, and are looking forward to try it in their home.